Manage your team, your communication and your product. Our unified inbox feature collects information from multiple channels and serves it on a single, readable page. No more juggling e-mails, phone calls and chat conversations - all the data you need for work is now available in one, powerful tool. Sugester Helpdesk includes a full-featured task management suite. Our tools help you create tasks, assign them to team members, combine them into projects and measure the time spent on each action. This information can be easily exported as a timesheet or an invoice to streamline your billing process. Stop wasting your team's time by answering the same customer question multiple times. Sugester Helpdesk makes it easy to create a database of re-usable content and automate resolving common user issues. You can also ask users to give feedback on their interactions with your team and use the obtained data to create the best customer experience possible. No more digging through e-mails, phone call histories and chat logs - now all your communications are available on a single inbox page. With Sugester Helpdesk everyone knows what to do. Our system makes it easy to divide the workload between your team members and monitor their progress. Never be in the dark about what's going on in your business. Our built-in activity tracking system lets you monitor your team's productivity in real time. 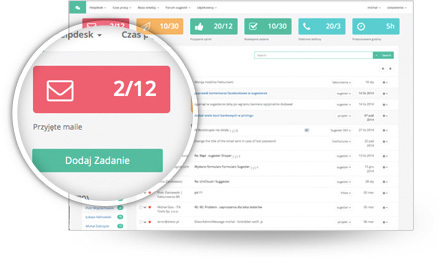 Sugester Helpdesk offers you a hassle-free solution for generating timesheets and invoices - just choose the tasks or projects you want to account for, and generate the document you need. What are the bottlenecks in your process? Our work tracking & analytics tool will show you exactly where all the time goes. Stop repeating yourself and build a time-saving database of canned responses to common user questions with the added benefit of creating a consistent and professional customer experience. Customer satisfaction is the key to your success. Automated feedback collection will let you make sure that your users are happy with your product and support. Start your free 30-day trial of Sugester Helpdesk now.